Nothing just happens. 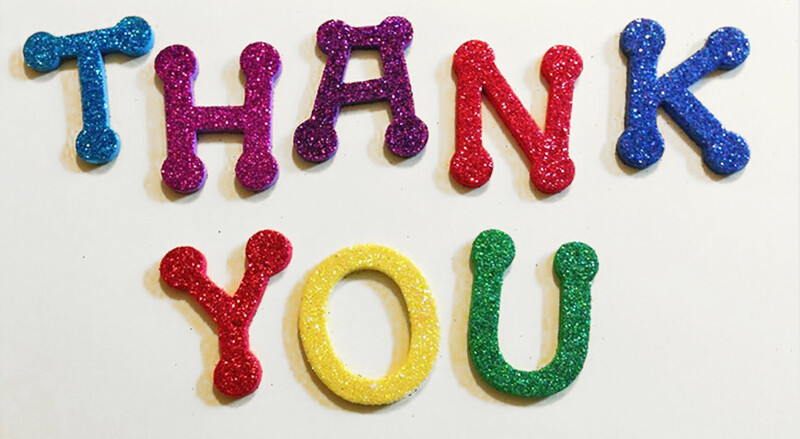 Thank you so much for all your hard work on behalf of our community's disadvantaged young people. You are opening a new world to our Lighthouse youth, many of which are homeless, abused and neglected and are living in our group homes or residential facilities. The activities that middle class families take for granted are a rare treat. You have provided our young people with experiences beyond anything they ever hoped for and imagined. I express appreciation on behalf of all you have touched. Lighthouse Youth Services, Inc. First, I want to say thank you for thinking about urban kids and helping me to not only reach and change them but also expose them to new cultural experiences. Phantom of the Opera was a real treat and a reward for good choices and positive changes I have seen in the child who was the recipient of these tickets. Thank you for your gift! I am a Big Brother with Warren/Clinton County and I wanted to thank you and your organization for the XU basketball tickets we received for the game this past Wednesday night. My little brother and I had a wonderful time at the game! We went down a little early and walked around the campus to see both the academic and residential buildings. He is 14 and we talk about college a lot and we do a lot of our activities on Miami's campus. He was very interested to see a different university. The arena at XU is top notch and we really appreciate the opportunity to do something unique for our weekly activity. - Steve P., Big Brothers Big Sisters of Warren & Clinton County The Teens actually also enjoyed the Holiday lights a lot. I was surprised that they did not think they were too old. I am hearing them say "oh remember when we took that trip to" ..... and laughing about it! This is the first time I ever thought my teen programming was working. Thank you so much for making so many great memories for them. The laughs are contagious, and something these youth deserve just as much as others. Students are rewarded through tickets! 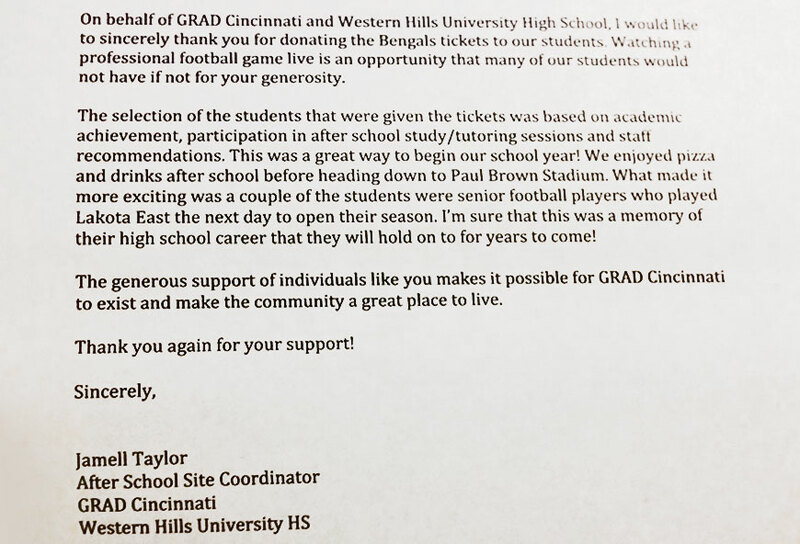 A thank you note written by GRAD Cincinnati! 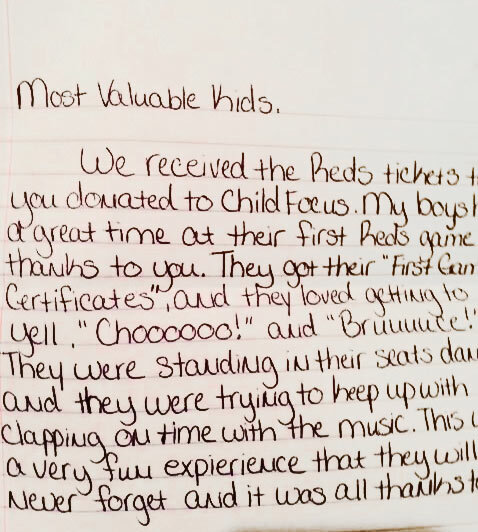 We love sharing these notes with our donors! 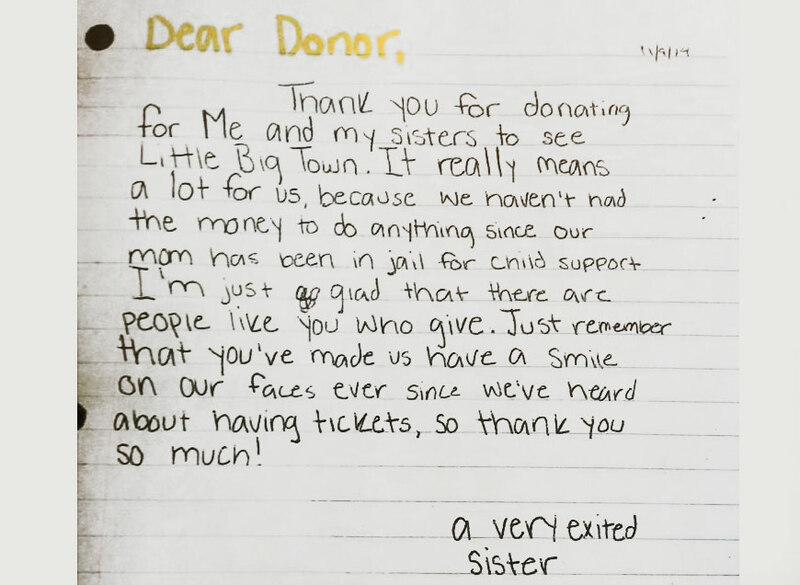 We appreciate that our recipient agencies take the time to write them! I want to thank MVK for our tickets to Disney on Ice. Our suite was so nice. I have never been to anything like that before. We had so much fun. My favorite part was the seven dwarfs. Thanks MVK. - Larry, Boys and Girls Clubs of Greater Cincinnati Thank you for the tickets to the Bengals Game. It was really cool to watch the team practice, meet the players and get their autographs. I've never been this close before. - Friends of the Children/Family Services Hi, my name is Brittney. I loved Disney on Ice. When I grow up, I want to be a skater like they were. 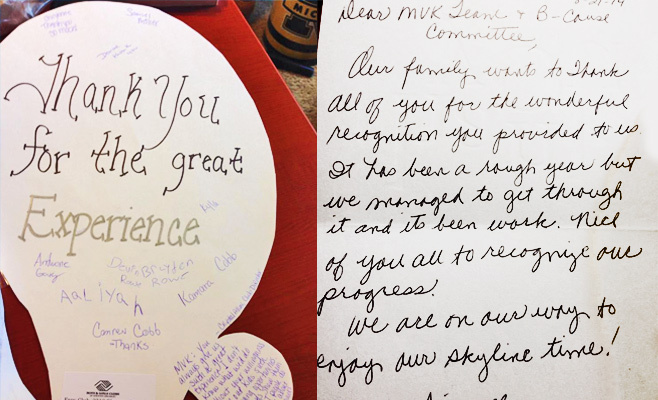 Thank you MVK. 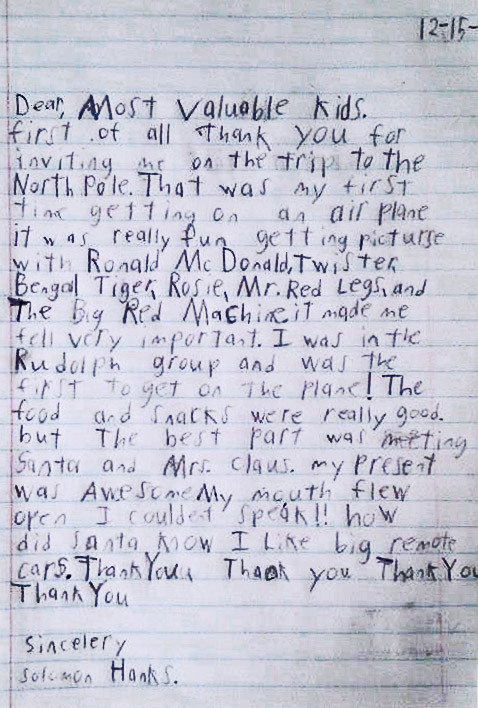 Thank you for the tickets to the zoo. We had a great time. I love to see the animals and it was nice to be together as a family. 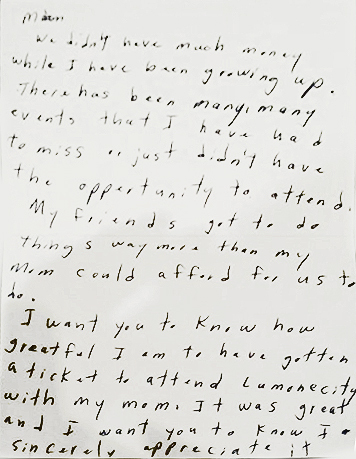 - The Robbins Family, YWCA Thank you so much. We are so excited! More "girl time" together. She has never been to a hockey game before. Thanks for always supporting us. I LOVE my "sister". She is soooo special! 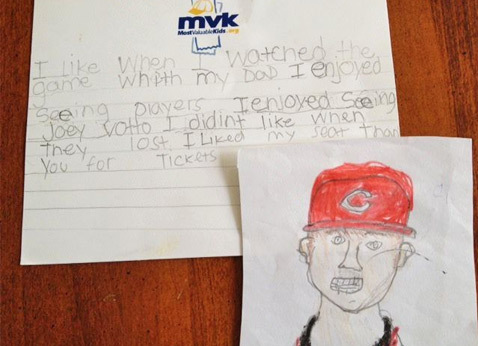 - Paige and Christy, Big Brothers Big Sisters of Greater Cincinnati I had a lot of fun at the ballet. I have never seen such beautiful dancing like that. They must have had a lot of practice to do all of that dancing. It must of took them a month to get all of the hand motions right. I really enjoyed having the opportunity to go! 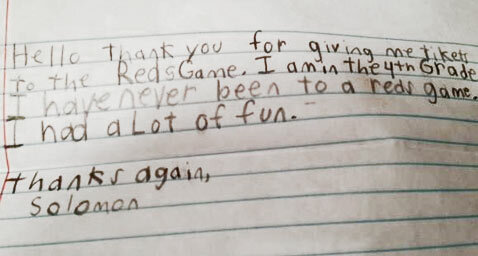 Chalk this one up to an adorable thank you note! This is for you Netherland Rubber Company. 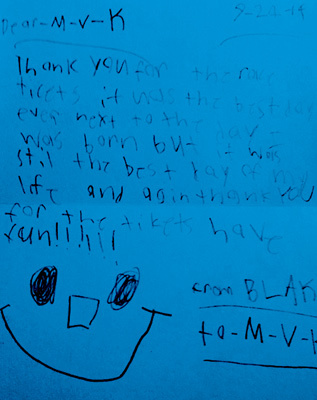 Thank you for the race tickets, it was the best day ever next to the day I was born! But it was still the best day of my life and again thank you for the tickets! "We didn't have much money while I have been growing up. There have been many, many events that I have had to miss or didn't have the opportunity to attend. My friends got to do things way more than my mom could afford for us to do. I want you to know how grateful I am to have received a ticket to attend Lumenocity Cincinnati Symphony Orchestra with my mom. It was great and I want you to know I sincerely appreciate it." 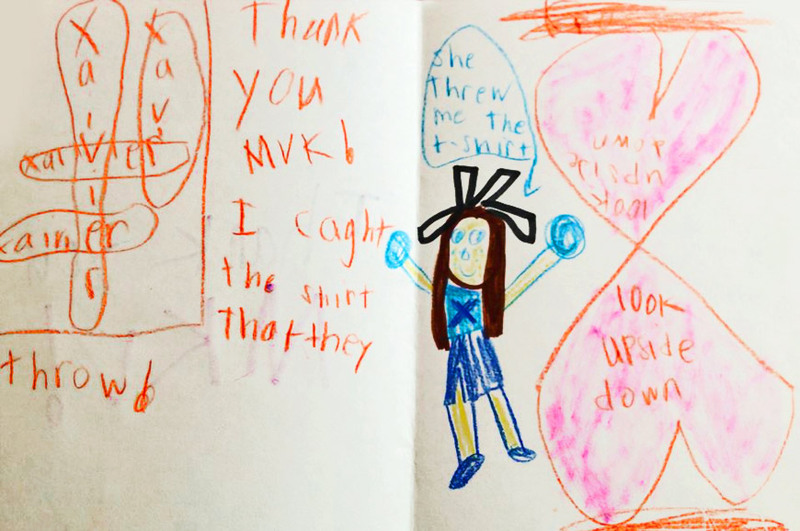 Thank you notes affirm our mission! 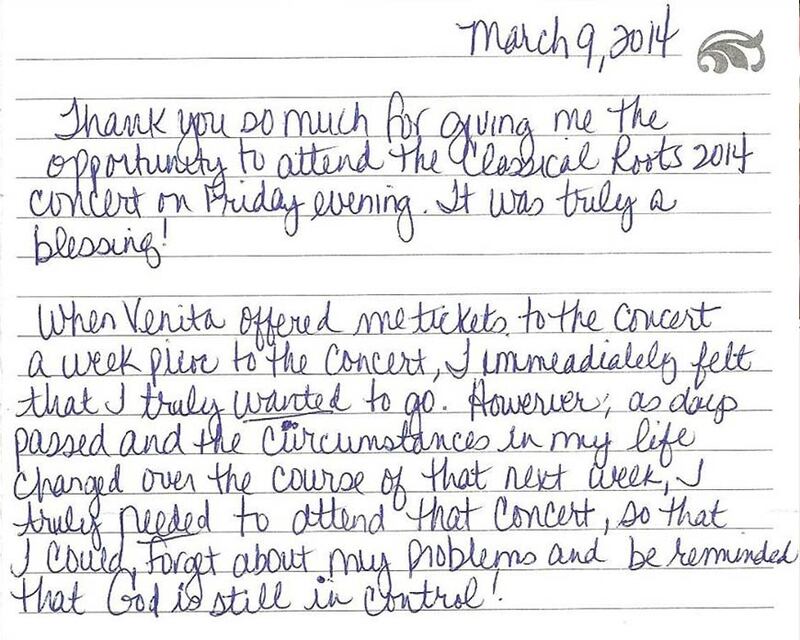 We love working with our venues, donors and recipient agencies to make moments like this possible! 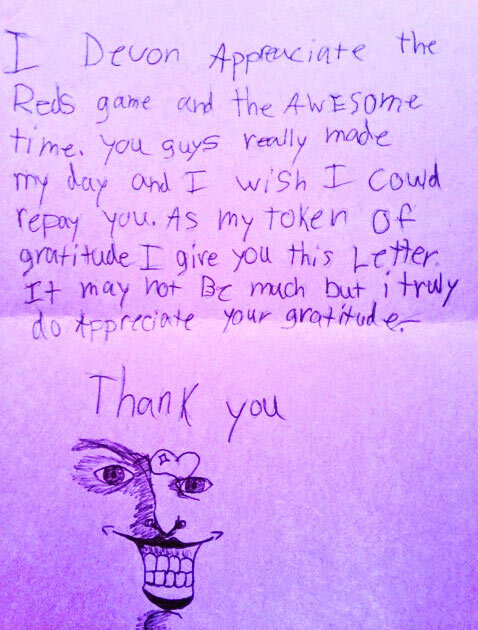 As always we are so grateful to the Cincinnati Reds, Season Ticket Holders and MLB! 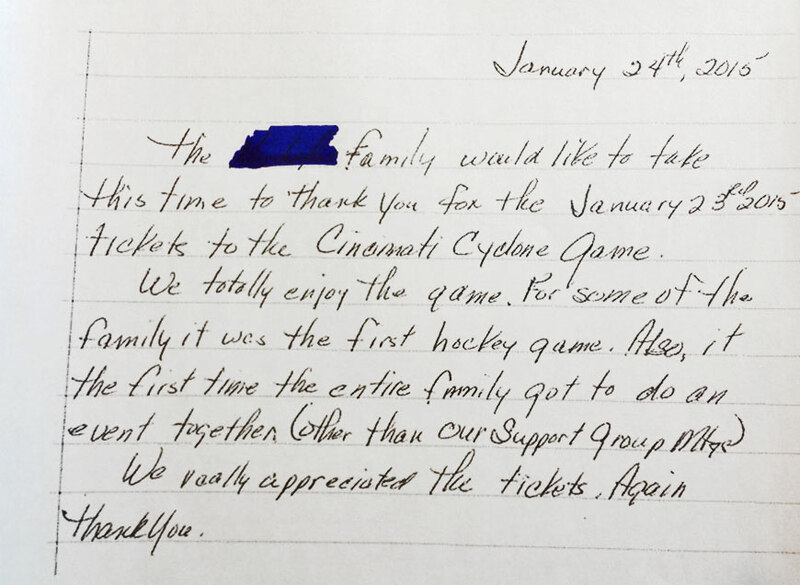 Over the past two days, over 350 tickets have been distributed to our recipient agencies.